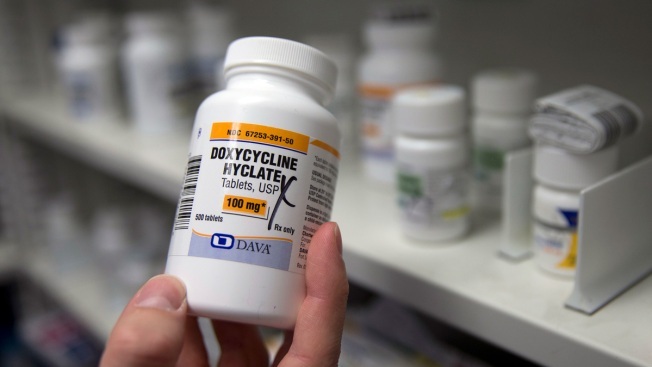 In this Friday, July 8, 2016 photo, a pharmacist holds a bottle of the antibiotic doxycycline hyclate in Sacramento, Calif. According to a study released on Monday, April 8, 2019, sniffling, coughing kids who were seen via telemedicine visits were far more likely to be prescribed antibiotics than kids who went to a doctor’s office or clinic. Sniffling, sore-throated kids seen via telemedicine visits were far more likely to be prescribed antibiotics than those who went to a doctor's office or clinic, according to a new study.